The lyrics above are from a Brazilian Easter song for children. It translates to something like this: “Easter bunny, what are you bringing me?”, and the bunny answers: “One egg, two eggs, three eggs just like these!”. 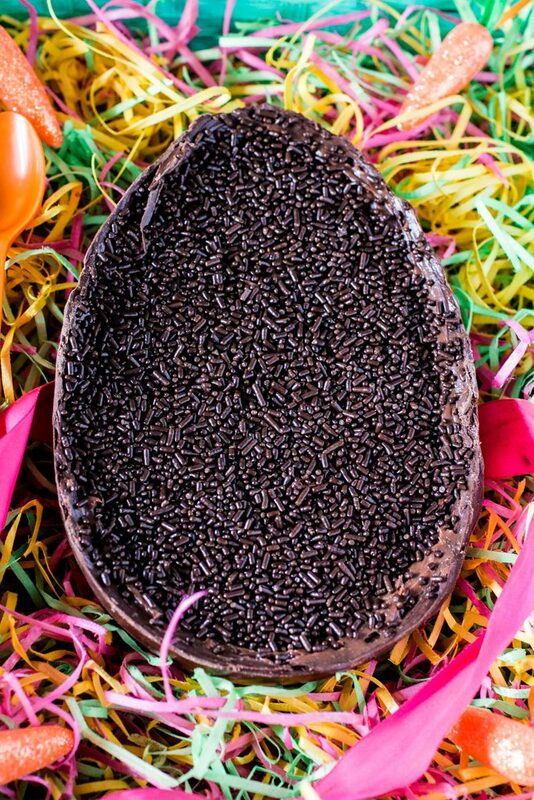 It’s Easter time and, for Brazilians, that means LOTS of chocolate. Especially in the form of oversized chocolate eggs (Ovos de Páscoa, in Portuguese), just like the song says. Walk into any Brazilian grocery store at this time of the year and, if you’re tall like me (or over 5’11”), you’ll probably have to duck. Hanging from the ceilings, up and down the aisles, are lots of HUGE (football-sized) chocolate eggs, wrapped in colorful and metallic paper. They are usually hollow and have toys or bonbons inside. Families and friends from all over the country will be exchanging delicious chocolate eggs this year. And me? Well, even though I could go to a Brazilian store here in NY to buy an egg, I decided to be adventurous and make my own. But not any kind! Oh no, that would be so lame! I made chocolate egg filled with BRIGADEIRO! You’re welcome! ? I realize that I should have posted this a few weeks ago, so you could have time to order the egg mold online (assuming you don’t already own one!). Oh well, there’s always next year. Or, if you’re always late to the trends like me, you could still make a few of these and give them as belated Easter gifts to your loved ones. Ooooor you can just make it and devour it by yourself! ??? Because, trust me, once you taste it, you will be tempted to! I prefer to gift them separately, one half per gift, displayed in a nice basket or box, with a colorful plastic spoon so one could eat the soft serve brigadeiro before biting into the egg. I also realize a 2-pound egg is not for the faint of heart, so in the instructions below, I’m giving the option of making two one-pound eggs. Go ahead and divide it even further, making four 1/2-pound eggs or even smaller, depending on what size molds you have. And, please, don’t be intimidated at the idea of “making” chocolate. Tempering chocolate is not as hard as it sounds and the results don’t have to be “store perfect” at first. Homemade beats store-bought every single time! Don’t you agree? Besides, once you start making these, it will quickly become your favorite Easter tradition. And practice makes perfect! So in a few years from now, I expect you to have opened your own Easter Chocolate Eggs business and are on your way to becoming a billionaire. Deal? Deal! Divide the chopped chocolate into three equal parts. Then, slowly add the remaining chocolate to the melted chocolate, stirring gently, until all the chocolate is melted and the thermometer reads 88 to 89F degrees (85 to 86F degrees of using only milk chocolate). Using a silicone brush, brush a layer of chocolate into your mold(s). Bring the mold(s) to the fridge for 10 minutes. Then, brush another layer and bring it to the fridge again, for 10 more minutes. Repeat this process until you've brushed 4 or 5 layers of chocolate and your egg(s) is/are firm and thick enough to hold the brigadeiro, leaving the mold(s) in the fridge for 15 minutes after the last layer. When the chocolate is solid, use a butter knife to carve out the excess and make the edges neat. Then, flex the mold(s) to gently release the chocolate egg)s). Take your time - you will see the air slowly creep its way between the plastic and the shiny, hard chocolate. If you're having difficulty releasing the chocolate egg(s) from the mold(s), just bring it back to the fridge, upside down, with some parchment paper under it, and the egg(s) will eventually release by itself. In a saucepan, combine the butter, sweet condensed milk and the cocoa powder. Bring it to the stove, over medium low heat, stirring until everything is combined. Keep stirring (constantly!) and cook until the brigadeiro thickens and starts releasing from the bottom of the pan (about 10 minutes). Remove from heat and add the heavy cream, mixing until smooth. 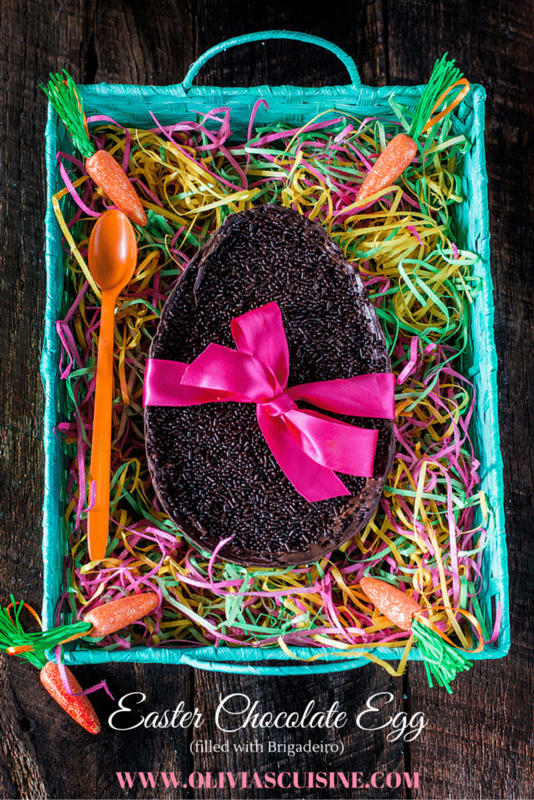 Then, transfer the brigadeiro to a medium sized bowl and wait for it to cool completely before adding to the chocolate egg. 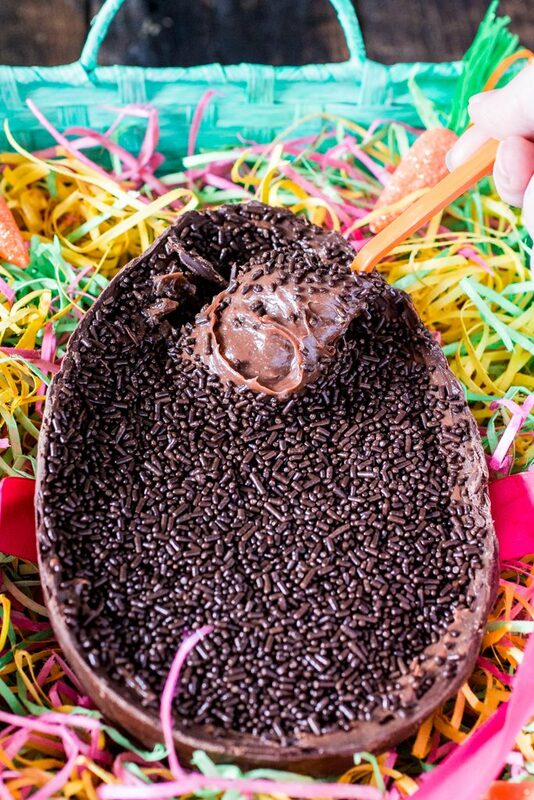 When cool, fill the chocolate egg(s) with the brigadeiro and finish by decorating it with the chocolate sprinkles. 1) If the melted chocolate starts cooling too much (and getting hard), you can microwave it at half power to bring it back up. 2) Don't have a thermometer? Don't fret! The worst that can happen, if your chocolate is not properly tempered, is a mottled look, which doesn't alter taste.